Eamon Gilmore said the government is eager to listen to the women about their needs and about what its response to the report should be. 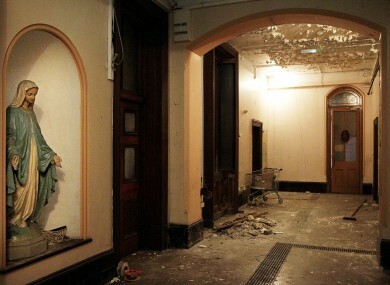 The interior of the now derelict Sisters of Our Lady of Charity Magdalene Laundry. TÁNAISTE EAMON GILMORE has said today that he and Taoiseach Enda Kenny intend to meet with Magdalene Laundry survivors next week to have a “direct discussion”. Members of the Magdalene Survivors Together said they were left “devastated” when the Taoiseach stopped short of issuing a full apology and called on Kenny to meet with them. Speaking on Newstalk Breakfast this morning, Gilmore said they will have a discussion with the women “about what their needs are and about how government should respond to this report”. He said the government decided to publish the report immediately and so it didn’t have time to consider its response. However he said the women are entitled to be listened to at the highest level of government. A government spokesperson told TheJournal.ie that the details of the meeting have yet to be confirmed. Yesterday the Magdalene Survivors Together group said that they hoped the women would not be forgotten because of the events in the last few days surrounding the IBRC promissory note. Email “Taoiseach and Tánaiste to meet with Magdalene survivors”. Feedback on “Taoiseach and Tánaiste to meet with Magdalene survivors”.